The SharePoint 2010 MySite has changed in major points to the one in SharePoint 2007. The most striking renewals are probably the tagging und activity features. The user can now tag, comment and rate his sites and documents. Since SharePoint 2010 has no longer a Shared Service Provider the MySite is now bound to the Profile Service. This means that the profile service must be running and configured before you can create a MySite. The MySite uses a special master page, the "mysite.master", which is activated by the feature MySiteLayouts and uploaded to the master page gallery of the MySite sitecollection. It's relatively easy to change and switch the masterpage either by hand or by feature. The sitecollection administrator can upload a masterpage to the masterpage gallery and easily switch the master. Open the site in Firefox and open Firebug. 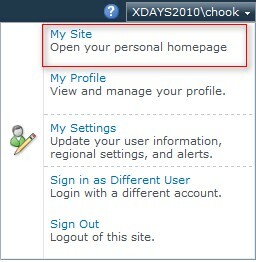 Click the selection arrow and select the "Site Action" menu. You will see a html code like show above. An <a> Tag surrounded by a <span> or <div>.